With its enormous problems fielding armored formations of any size, the U.S. Army that waged the Korean War was by necessity an infantry army. Far from a mere bayonet force, the U.S. Army went to war copiously supplied with firepower, and acquired even more in the course of the conflict. 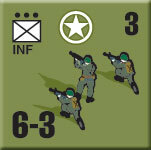 The U.S. Army infantry platoon went to war in 1950 under substantially the same organization with which it had ended the Second World War. The rifle squad had been reduced from 12 men to nine, and still only carried a single Browning Automatic Rifle among them for fire support. The rest of the troops had the M1 Garand semi-automatic rifle. 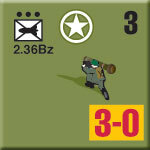 As the war went on the important of automatic weapons became ever more clear, and many squads added a second BAR. That change became official in April 1953, but the Army rejected a recommendation from the Field Forces (formerly Ground Forces) command to add two men to the rifle squad, a BAR gunner and an assistant, to serve the additional weapon. That change only came after the war’s end. The rifle company included a Heavy Weapons platoon with two Browning M1919 light machine guns and three 60mm mortars; an organizational change in May 1952 doubled the number of machine guns. Like the addition of more BARs, this change came in response to Chinese mass assault tactics (the so-called “human wave”). The infantry battalion had three rifle companies and one weapons company. The rifle companies had three rifle platoons and one weapons platoon. The weapons company had two machine gun platoons, each with four Browning M1917 heavy machine guns, and a mortar platoon with six 81mm tubes. 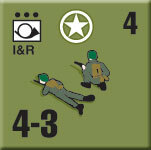 Both of those changes to the rifle companies post-date the end of the scenario set in Korean War: Counter Attack; we’ll reflect them in the next volume, Korean War: Intervention, with new infantry platoons. We’ll probably leave the machine gun platoons alone and just increase the number in play, since we use the same piece to represent both types of unit now (one could argue that one or the other should be a little stronger or weaker, but it didn’t seem worth the potential confusion caused to players). Each American infantry regiment included an Intelligence and Reconnaissance, or I&R, platoon. This was a small unit, just two squads with no automatic weapons (though most platoons acquired these on their own). It performed the missions in its name, but some regimental commanders used it as their personal palace guard. The most famous action of an I&R platoon came at Lanzerath Ridge during the Battle of the Bulge, where a platoon from the 99th Infantry Division made a heroic stand fighting as infantry. The attention paid to that action helped spread the misconception among some commanders that an I&R platoon represented a last-ditch infantry reserve rather than a forward-deployed asset. One American parachute outfit fought in Korea, the 187th “Rakkasan” Airborne Regimental Combat Team (which included the 187th Airborne Regiment, the 674th Field Artillery Battalion, an engineer company and later a platoon of M24 light tanks). The paratroopers had undergone a major change at the end of World War II, switching their platoons from two rifle squads to three and the primary individual weapon from the M1 carbine to the M1 Garand rifle. Each squad now also received a BAR. 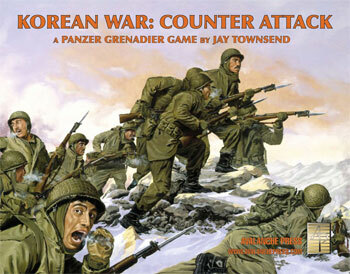 Jay Townsend, the designer of Korean War: Counter Attack, chose to go with lower firepower ratings like those in the World War II Panzer Grenadier games to reflect the American practice in Korea of jumping “light.” I let that stand, but had I designed the game myself I probably would have gone with higher firepower on the pieces (probably 7-3 direct fire) with a special rule limiting it during airborne landing scenarios. Which sort of defeats our stated purpose of never asking players to “pretend X is Y” so he probably made the right call. When the Rakkasans fight the Chinese later in the war as ground-pounding infantry with their full allotment of support weapons, we’ll likely go with a new piece to reflect this. American combat engineers were well-armed and trained to fight as infantry, which encouraged higher-level commanders to deploy them in an infantry role. And American engineers took great pride in their combat record, but in Korea their greatest achievement came in their construction role: destroying bridges and other road chokepoints during the retreat to Pusan, and rebuilding them during the breakout from Pusan. Each division had an engineer battalion of four companies; independent engineer battalions had but three. The divisional battalions also had, at least on paper, an assault platoon. Army doctrine recognized that combat engineers would often fight as infantry, but stressed that they did not have as much tactical training or as many automatic weapons as actual infantry and had no heavy support weapons (mortars or recoilless rifles). 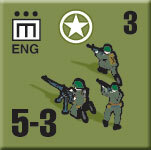 Even more than the infantry squad, the combat engineer squad depended on its leader. The squad leader had to be even more conversant with battle tactics than his infantry counterpart, given the lesser level of training of his men, but also was expected to perform the same role as a civilian construction foreman with equal competence. That made solid engineer non-commissioned officers very hard to find. Inspired by captured Bazookas, the Germans developed their own, much larger version known as the panzerschreck. The 88mm rocket of the panzerschreck proved much more effective against armor than the Bazooka, thanks to its greater size. After the war, the Americans in turn copied the German copy of the original Bazooka, to produce the 3.5-inch M20 Super Bazooka. When the Korean War erupted, American arsenals in Japan held only the old M9 Bazooka. The 2.36-inch rocket could not damage the North Korean T-34/85, and an emergency airlift brought the 3.5-inch Super Bazooka to the front lines; the heavier weapon proved far more effective at knocking out the enemy tanks. Some Panzer Grenadier players did not like designer Jay Townsend’s decision to portray the Bazooka teams as separate pieces rather than fold their capabilities into the game’s rules for infantry anti-tank weapons. I wasn’t very fond of them when I first noticed their inclusion among the proposed playing pieces. 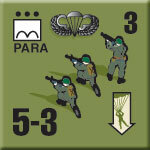 Army organization in 1950 held the Bazookas at battalion level in a special squad – exactly as they are portrayed in the game. 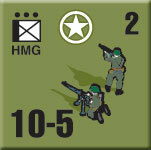 When the 3.5-inch rocket proved so effective and more Bazookas became available, the squads were extended to company level. Finally in 1952 enough were on hand to abolish the special units and give each rifle platoon three of the weapons. You can order Korean War: Counter Attack right here.